The 50,000 mile Lufthansa Premier Miles & More World MasterCard® offer is currently one of the best airline credit card offers available. It’s one of the few sign-up bonuses that is worth a roundtrip flight to Europe from the US. Since it’s a valuable recurring offer I’m updating and adding more info to this series that will cover the basics of the Miles & More frequent flyer program and using Lufthansa miles. The increased 50,000 mile bonus offer for the Lufthansa Premier Miles & More World MasterCard® is currently one of the best airline credit card offers on the market. You’ll earn 50,000 bonus miles after spending $5,000 within 90 days, and after meeting the spending requirement you will have enough miles for a round trip ticket to Europe from the US or two round trip flights within the continental US. When you use airline miles to book an award ticket you will always pay for government taxes and fees, but depending on what airline you fly on, you may also pay fuel surcharges. Fuel surcharges are additional fees that an airline charges to cover part of the cost of the ticket and are non-revenue earning. Essentially you are paying for the fuel cost to fly you to your destination. Most of the time you will not be charged a fuel surcharge on award flights within the US, however, on international awards you are more likely to incur them. Lufthansa charges fuel surcharges on all of their award flights and also many of their partner airlines, so to maximize your miles it is best to book awards that do not include fuel surcharges. You can unlock more value using Lufthansa miles by choosing to redeem the miles with specific airline partners or by flying to specific regions around the world. If you end up applying for the The Premier Miles & More® World MasterCard® and earn the 55,000 miles from the card, you should consider the best options for using your miles. What Fuel Surcharges Mean for You? On all paid tickets the bottom line is the total cost of the ticket, and it’s not necessarily important how much of the ticket is base fare vs. fuel surcharges. 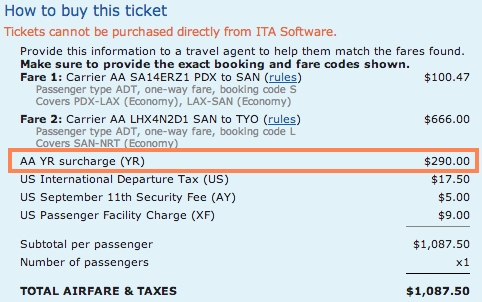 In this example the fuel surcharges came out to be $290 on a one-way ticket from Portland to Tokyo flying on American Airlines. It’s clear that to get the most value from your airline miles you always want to avoid paying fuel surcharges, afterall the lower your total fees are, the more you save. When you really start to research the cost saving opportunities on award tickets you can even go as far as flying into or out of different countries to avoid high airport taxes. Unfortunately, Lufthansa passes fuel surcharges onto many of its partner airline award tickets booked with Lufthansa miles. However, depending on the airline you fly on, you can largely avoid or minimize the cost of fuel surcharges. That means on many Lufthansa partner award flights you can still pay $0 or very low fuel surcharges. This will only leave you paying the normal government taxes and fees which are unavoidable. This post will outline which Lufthansa partners charge zero or low fuel surcharges on some routes. Lufthansa is part of Star Alliance and the Miles & More alliance which makes it possible to use Lufthansa miles on any of the 26 Star Alliance partner airlines as well as the 9 Miles & More partners. You can use Lufthansa miles and pay no or low fuel surcharges for flights within North America and to Hawaii and Alaska, Europe, Central America, South America, the Caribbean, Africa, and Asia. Overall the Lufthansa award chart is very competitive and their stopover and open jaw rules are among the most generous across all airline programs. You can get a stopover in each direction and can book a stopover on one-way awards. To easily compare award charts across different airlines see my Airline Award Chart Comparisons. An important point to remember when using Lufthansa miles is that if you connect through a third region on your itinerary, the award will automatically be priced out at the 3 region award level. That means that the airline and destination combinations included in this chart are not exhaustive, but rather include most of the options for one-way or round trip award options. It is possible to fly to many more destinations on each partner,however you may connect through a third region and pay the three region award price. This is only a good value if you want to add a stopover within the third region to see more destinations. You will never pay fuel surcharges on award flights out of Brazil. In fact, it is against Brazilian law to charge fuel surcharges on flights, which means you can fly out of Brazil on any Star Alliance partners and pay no fuel surcharges. You could also do something with an award to travel from the US to Africa or Asia with a stopover in South America. Lufthansa miles can offer amazing value if you know how to use them and by choosing the right airline to fly on, you can pay no fuel surcharges. On top of this you can incorporate stopovers on one-ways to create unique trips and get a ton of value from your miles. Because of this Lufthansa miles are among some of the best miles to use for award flights within the US, to South America, and flying on select airlines to Europe, China, and New Zealand. On the other hand, you can expect to pay fuel surcharges using Lufthansa miles on partner airlines which were included in the mid-level and high fuel surcharge list within this post. This means award flights to many European cities and the Middle East may cost more using Lufthansa miles than on United or other airline miles.